Mumbai is a cosmopolitan city that is rapidly progressing. Over a period of time there have been changes in the education system with rising pressure to excel in academics. Parents, teachers and students are always stressed due to cut throat competition in each and every field. As a result, students are often affected with psychological and behavioral issues. 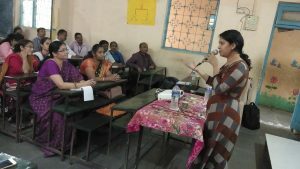 On 19th January a workshop was conducted by Ms. Kanchan Vishwakarma to educate parents on these problems commonly faced by children. The session specifically touched upon how children are burdened with a lot of studies and do not have the time to focus on physical activity. There has been a decline in the number of kids playing outdoors. Unable to enjoy a healthy childhood affects children in a negative way, resulting in poor academic performance. The session helped parents understand the importance of spending time with their children to minimize the occurrence of psychological and behavioral problems. We hope these sessions will help our children of tomorrow face and overcome societal and academic pressure. Next PostShraddha’s belief in herself will lead her to success!